A Touch of Italy right here in Yardley! The Best Specialty Pizzas in Town, Hands Down! Fresh Hot Garlic Knots. The Best in Bucks! Our Garlic Knots pair perfectly with any Italian dish. 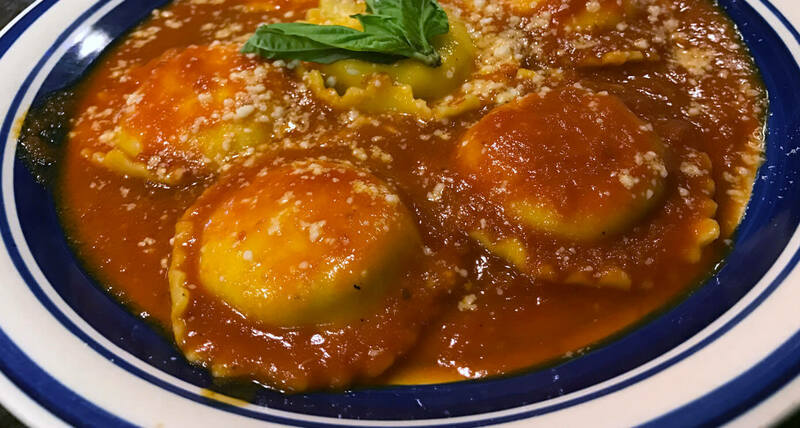 Savory Traditional Raviolis Await Your Taste Buds! Yardley's Hidden Gem for Authentic Italian Dishes. Nick and Tony’s pursuit to reveal the secrets of Italian delicacy with the rest of the world led them to America! Raised in the heart of Naples, Italy, the two best friends were determined to bring the distinct blends of herbs and spices to America. With this in their hearts and minds, they ventured over to the United States and brought to our community America’s favorite food . . . Pizza! With respect for their homeland, they named their dream “Venezia Pizza.” We’re dedicated to providing the community with not only superb pizza, but a commitment to customer satisfaction. Venezia Pizza brings the taste of Italy right here to Yardley Pennsylvania. We thank you for your patronage and friendship! Our Homemade Lasagna Made with Layers of Pasta Filled with Lean Ground Beef, Mozzarella, Ricotta and Parmigiano Cheese. Potato Dumplings Sautéed with Tomato Sauce and Parmigiano Cheese. Topped with Tomato Sauce Mozzarella, Parmigiano Cheese and your Choice of Spaghetti or Penne. Pillows of Pasta Filled with Ricotta, Topped with Tomato Sauce and Parmigiano Cheese. 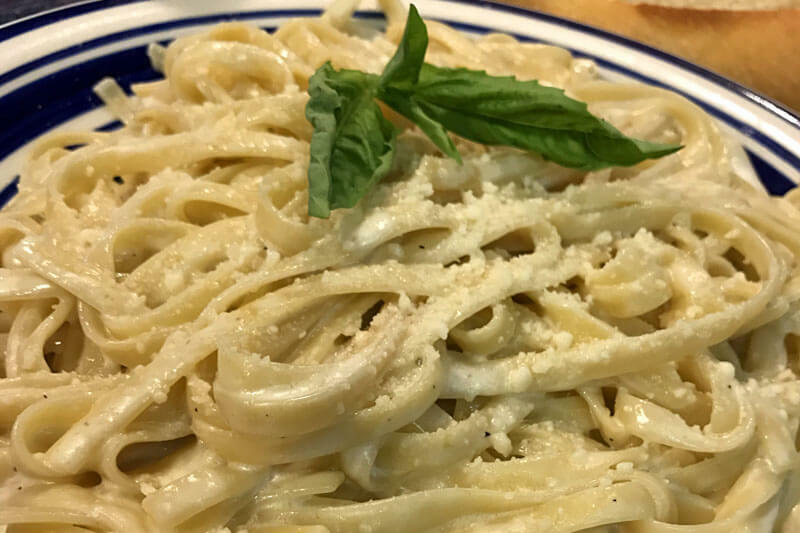 A Delightful Blend of Ricotta, Parmigiano, and Mozzarella Cheese Baked to Perfection with Penne Pasta. Enjoy the Distinct, Zesty, Peppery Flavor of Genoa Salame and Smoked Provolone Cheese. Fresh Lettuce and Tomatoes are Piled on Top. One of our Best, Topped with Red Ripe Tomatoes and Fresh Lettuce. Try our Oven Roasted Turkey and Take Your Taste to New Heights. A Timeless Classic. Enjoy Import Ham and Smoked Provolone Cheese on a Delicious Roll. The Perfect Italian Hoagie. Italian Ham, Salame and Smoked Provolone topped with Lettuce, Tomato, Onion, Hot Peppers, Oil and Vinegar. A Combination of Smoked Provolone, Mozzarella and American Cheese. Topped with Lettuce, Tomato, Onion, Hot Pepper, Oil and Vinegar. 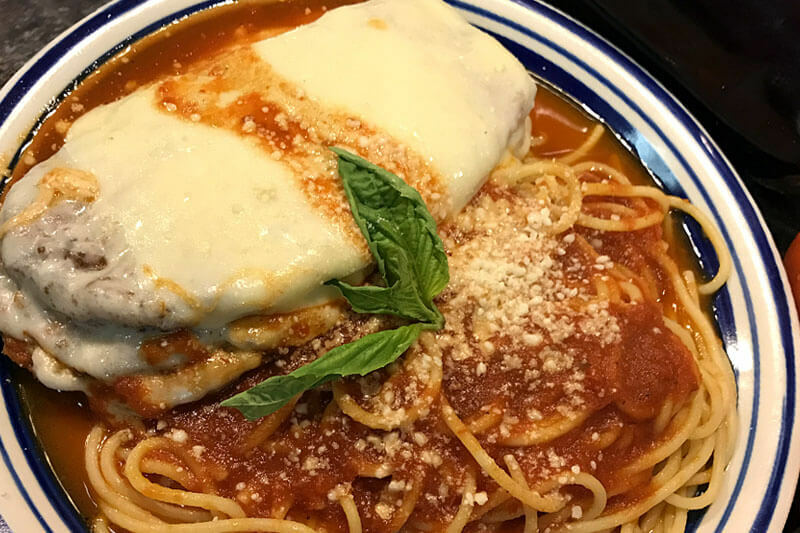 Grilled Chicken, Topped with Tomato Sauce, Parmigiano Cheese and Mozzarella. Lightly Breaded Eggplant topped with Tomato Sauce and Mozzarella. The classic Italian Sausage is grilled and topped with Griddle Fried Onions Bell Peppers and Tomato Sauce. Tender Chicken Breast lightly coated in Parmigiano Breadcrumbs, Tomato Sauce and Melted Mozzarella Cheese. Sweet Italian Sausage topped with our home made Tomato Sauce, Parmigiano Cheese and Mozzarella. Crusty Rolls Filled with Meatballs Sauce and topped with Mozzarella Cheese. Our Super Cheesesteak Works Comes with, Green Peppers, Onions, Mushroom, Hot Peppers and a Touch of Sauce. Oven Baked Cheesesteak with Mozzarella Cheese and Tomato Sauce. Sauteed Spinach Fresh Garlic and your our choice of Smoked Provolone or American Cheese. Our Classic Cheesesteak topped with Fresh Lettuce, Red Ripe Tomato, Onions, Hot Peppers and Oil and Vinegar. This Signature Favorite is Loaded with Premium Beef, American Cheese, Sautéed Green Peppers, and Onions. All of our Cheesesteaks are Made with Premium Beef and Grilled to Order. Sauteed Spinach, Fresh Garlic and your choice of Smoked Provolone or American Cheese. Sautéed Pepperoni and melted American Cheese. Our classic Chicken Steak jacked up with Smoked Bacon. Whole Chicken Breast shredded and grilled to Perfection. Sauteed with Fresh Spinach, Red Ripe Tomato, Fresh Garlic and your choice of Smoked Provolone or American Cheese. It’s the same Buffalo flavor you love on a Chicken Cheesesteak smothered in melted smoked Provolone Cheese. Fresh cut Romaine Lettuce tossed with Caesar Dressing, Croutons and shaved Parmigiano Cheese. Our Delicious Chicken Caesar Salad topped with Fresh Mozzarella and Tomato. Delightful Salad of Greens, Fresh Cut Romaine, Ripe Tomatoes, Roasted Red Peppers, Onions, Carrots, Cucumbers and your choice of Dressing. Juicy Grilled Chicken Breast over Crisp Romaine Tossed in Caesar Dressing, Croutons and Shaved Parmigiano Cheese. Fresh Mozzarella, Tomatoes, and Green Basil. Seasoned with Salt and Olive Oil. Made to Resemble the Italian Flag: Red, White, and Green. Sauteed Spinach, Garlic and Tomatoes Topped with Provolone over Romaine Lettuce. Simple Grilled Chicken over Fresh Cut Romaine, Ripe Tomatoes, Roasted Red Peppers, Onions, Carrots, Cucumbers and your Choice of Dressing. Made with Prosciutto and Onions Sautéed in Vodka Cream Marinara Sauce and Parmigiano Cheese. Penne Pasta Baked with Ricotta, Parmigiano and Mozzarella Cheeses in Our Homemade Tomato Sauce. Layers of Bolognese Sauce, Ricotta, Mozzarella and Parmigiano Cheese. 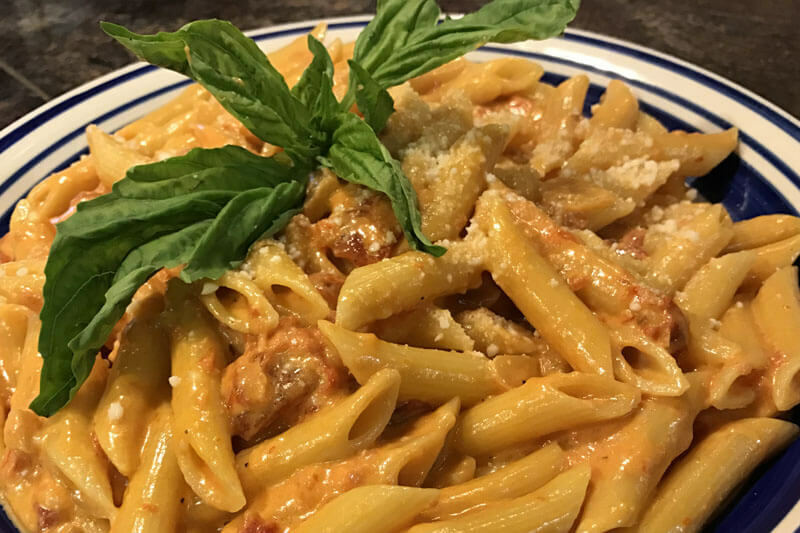 Crispy Breaded Chicken, Melted Mozzarella cheese, Tomato Sauce, Served with spaghetti or Penne. Chicken Breast in a Lemon Mushroom Butter Sauce, Served with Spaghetti or Penne. Sautéed Chicken Breast in a Savory Sauce of Mushrooms and Marsala Wine, Served with Spaghetti or Penne. Italian Sausage Topped with our Homemade Tomato Sauce and a Touch of Romano Cheese. Battered Mozzarella Cheese, Served with Tomato Sauce. Tasty Meatball Topped with our Homemade Tomato sauce and a touch of Romano Cheese. Heat up your Party with our Lip-Smacking Wings! Served with Celery and Blue Cheese. Serving size is One Dozen. Crusty Italian Bread Topped with Fresh Garlic, Olive Oil and a Blend of Herbs . . . Option to Add Cheese Available. Rings of Sliced Onion Battered and Deep Fried to Golden a Brown. 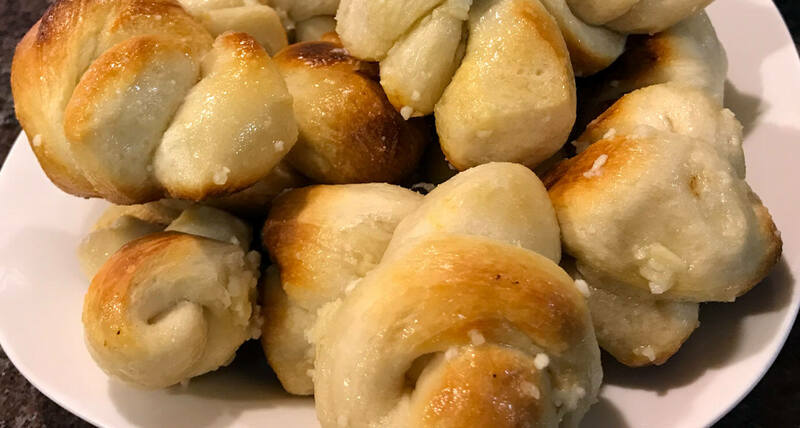 Twisted Pizza Dough Knots Tossed with Fresh Garlic and Parmigiano Cheese. Served with Marinara Sauce. Serving Size is One Dozen. Ham, Salame, Sausage, Pepperoni, Green Peppers, Onions, Mushrooms…………. Calzone, a Turnover Filled with Mozzarella and Ricotta Cheese. Mini Stromboli, Stuffed with Cheese and Steak. Mini Stromboli, Stuffed with Cheese and Pepperoni. Mini Stromboli, Stuffed with Cheese and Sausage. Mini Stromboli, Stuffed with Cheese and Two Choice Vegetables. Mini Stromboli, Stuffed with Cheese and Juicy Grilled Chicken. Mini Stromboli, Stuffed with Cheese and Chicken Steak. This Twist on the Classic BLT Sandwich Features Bacon Baked Right into a Light, Crunchy Pizza Crust. Topped with Fresh Lettuce and Tomatoes. It’s Literally a Cheese Steak in Pizza form, and it’s the Ultimate Party Food. Always a Hit, Never Any Leftovers! It’s also the Tastiest Way to Eat Vegetables . . . Ever! Spicy and Extremely Tasty. 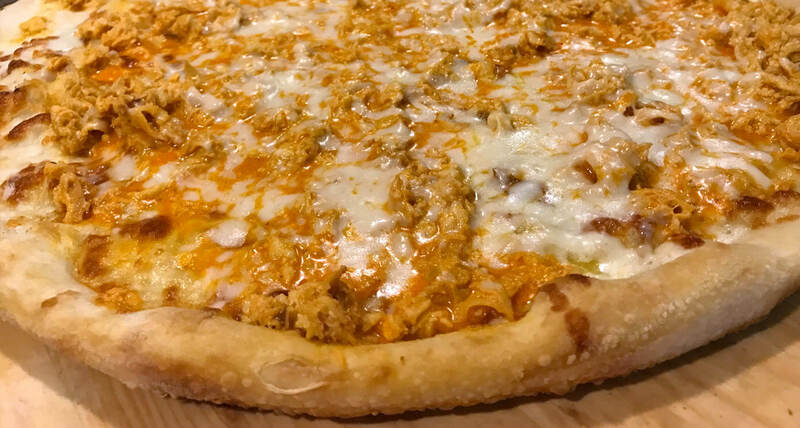 Easily the Best Buffalo Chicken Pizza You Will Ever Encounter. 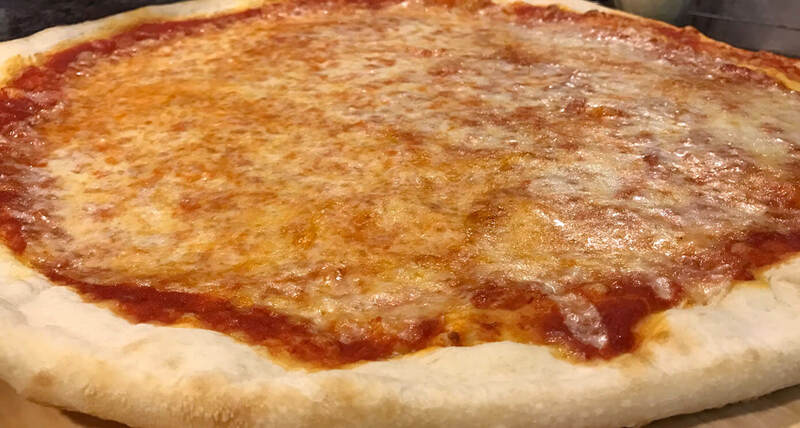 Three cheeses; mozzarella, ricotta and provolone. Italian sausage, bacon, pepperoni and meatball. Classic Tomato Pie made with Ripe Chunky Tomato, Fresh Basil, Fresh Garlic, Oregano, and a Splash of Olive Oil. Simply Delicious. A Crispy Pan Square Crust Prepared Sicilian Style and Cut into Squares. Great for Parties and Group Events! Our Signature Thin Crust Brooklyn Pizza Crafted with Fresh Mozzarella, Fresh Basil and Parmigiano Cheese. Our Famous Brick Oven Style Pizza. Nick and Tony have been serving up the greatest food since leaving their former employer to open this neighborhood gem. Many businesses have come and gone in this shopping center but Venezia has surpassed them all. The staff is always friendly and the food is authentic and extremely delicious. Pizzas are fantastic. I’ve been ordering cheesesteaks here for over 20 years. Loyalty works both ways between the clientele and the owners. Definitely eat here. Hand painted frescoes adorn the walls while serenaded by classic Italian music. We’re so glad we found this place after moving across the street last November! We order from Venezia weekly! Never one issue, the food has always been so delicious. I love the chicken cheese steaks and my boyfriend absolutely loves the buffalo chicken pizza . . . YUM! Went recently on a Friday night and for as busy as they were the service was still amazing. Nick and Tony are extremely friendly and always make the best Brooklyn pies! I usually don’t write reviews, but I’m making an exception for this this one. I recently traveled to Italy this summer and haven’t had a good Italian meal since. I’m new in the area and tried a few Italian spots around here, but nothing comes close to this one! The pasta here tastes exactly like something you’d order in Italy. My husband and I can’t get enough! I’m a vegetarian, so I usually just get pasta with red sauce. My hubby gets chicken parmigiana, which he absolutely loves. We’ve had their pizza too and I highly recommend the Brooklyn style pizza. 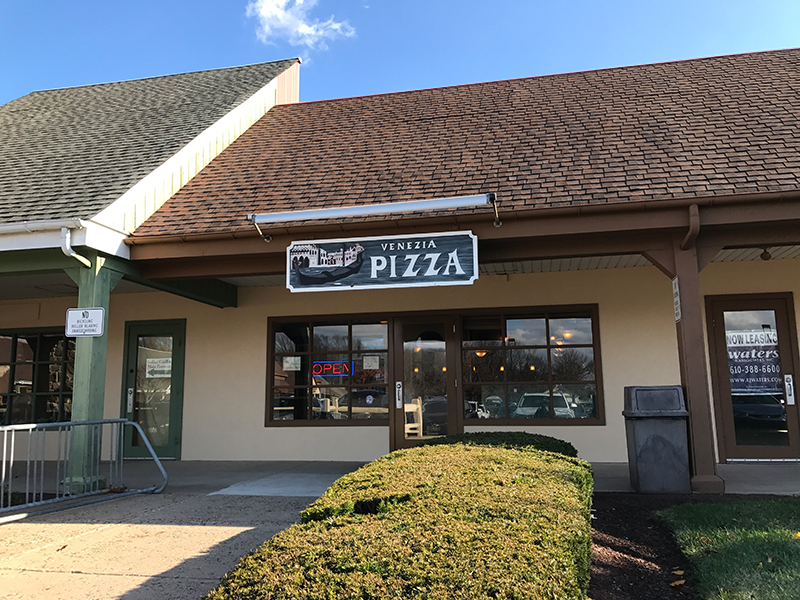 If you decide to give Venezia Pizza in Yardley, PA a try you won’t be disappointed! I recently went to Venezia Pizza with my family and I have to say . . . WOW, Great Margarita pizza! The staff was so friendly and attentive! Venezia has the best Pizza and service around Yardley, PA. They use premium toppings on the pizza and always get the order right. It’s a pity they don’t deliver but it’s worth calling ahead to pick up. With Great prices, excellent service, and some of the best food you’ll ever taste . . . Venezia Pizza in Yardley is just the best there is! We’re always looking for bright, energetic, friendly people to join our team! If you’re looking for work, speed up the process by printing out these three forms, filling them out, and bringing them with you when you come in. See you soon! Copyright 2017 Venezia Pizza. Website Developed by RDC Design Group, LLC.